SKU: PCC06. Categories: Miscellaneous Serving, Party & Event, Serving Equipment. Tags: revere bowl, serving bowl, silver bowl. 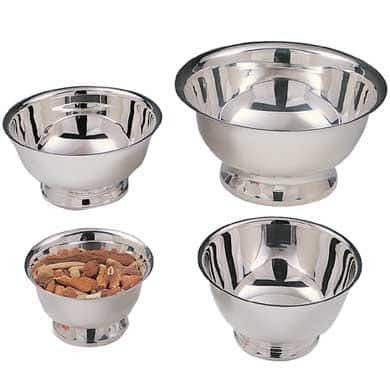 A revere bowl is a silver serving bowl that actually takes its name from the American Patriot (and silversmith) Paul Revere! We also carry these bowls in 4″, 6″, and 8″ each of which are rented separately. This is a great serving piece to which can be used to save table space. The tiers measure 10″, 15″, & 20″ respectively and the complete tray is 21″ tall.